Here you can see samples of my wildlife and equestrian paintings and pet portraits in watercolours, acrylic and mixed media. 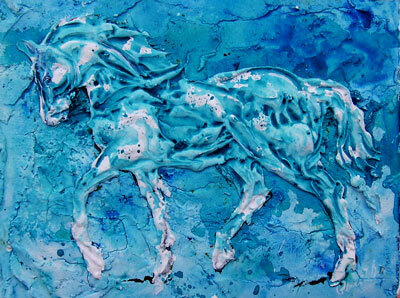 These paintings combine my passion for movement, colour and texture with my love of animals and wildlife. Whether in watercolour or mixed media canvases, I can make my emotionally led textures far more accessible by using animal forms as the hook on which to hang the expressive nature of the paintings. This is no compromise but a sincere wish to communicate to a wider audience than the insular world of the artist. It also allows them to be viewed as both representational and as abstract textural pieces, rather like the cave paintings of early man. Therefore I only sell originals, as no printing process can capture their colour, texture and power.